SEOUL, Oct. 23 (Yonhap) — Women’s golf legend Annika Sorenstam on Monday hailed the “amazing work ethic” of South Korean players, who’ve dominated the LPGA Tour in 2017. Sorenstam is visiting Seoul in promotion of Pacific Links International, an international golf membership company that announced the launching of its Korean service Monday. 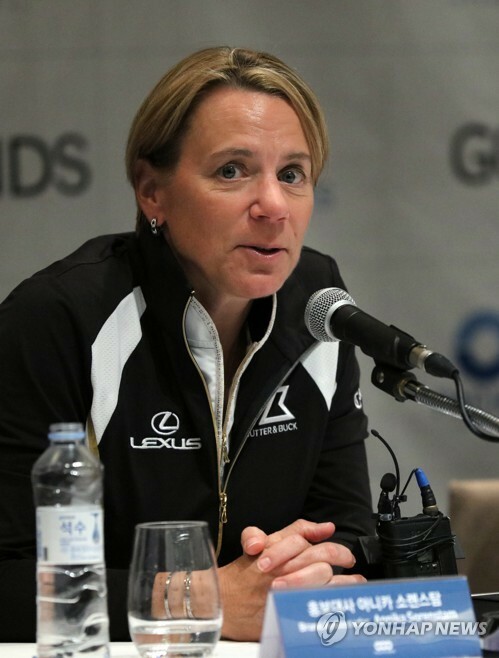 Sorenstam, a World Golf Hall of Famer with 72 LPGA wins and 10 majors to her credit, is uniquely positioned to comment on the excellence of South Korean players. In the late 1990s, she competed against the first generation of Korean stars in the LPGA, led by fellow Hall of Famer Pak Se-ri, and saw how the players inspired by Pak have grown to take over the tour. In 2017, South Koreans have combined to win 15 out of 29 LPGA tournaments. Sorenstam said she has taken notice not just of recent Korean champions but also others who’ve placed inside the top 10. Sorenstam said she wouldn’t be surprised if the trend continued, noting that the Korea LPGA (KLPGA) Tour serves as a “strong pipeline” for talent. Sorenstam also paid tribute to Pak, saying she has “a lot of respect” for her. Sorenstam is an international brand ambassador for Pacific Links International, founded in 2009 by Chinese-Canadian businessman Du Sha. It started its membership services in 2013. It said South Korean members will enjoy access to 640 golf courses in 30 countries, including such popular tracks as Pebble Beach in Monterey, California, and TPC Sawgrass in Ponte Vedra Beach, Florida. The company said it is currently affiliated with 15 courses in South Korea, a number it’d like to see increase down the road. Pacific Links’ individual members must pay an initiation fee of US$15,000, and their annual fees are $500. A family of two can sign up for membership at $24,000 for the initiation fee and $750 in annual dues. All members can enjoy a round of golf at affiliated courses for $60.